In Le Locle, the historical cradle of Swiss watchmaking, Georges Favre-Jacot began training apprentices even before he himself came of age. Nonetheless, this brilliant watchmaker also nurtured other ambitions: namely, to create the most accurate and reliable watches ever made. He soon understood that he would have to revolutionize production methods if he were to achieve this – for at the time, artisans were scattered among small workshops in the surrounding region or worked from home without any links, whereas all the parts of complex mechanism need to be capable of smooth interaction. From 1865 onwards, at the age of 22, Georges Favre-Jacot thus commissioned the building of spacious light-filled premises where he brought together the full range of watchmaking professions, encompassing the production of movement components as well as enamel dials and cases. The first true Manufacture in watchmaking history was born. This mastery of all stages of production under a single roof represented a giant leap forward in creating high-quality watches able to meet the strong demand from customers around the world looking for watches capable of displaying the correct time. The approach was all the more successful in that Georges Favre-Jacot continued developing new machines and production technologies intended to constantly improve the quality and precision of his timepieces. To back up the hand-crafted care devoted to the design and finishing of each timepiece, the founder-watchmaker once again demonstrated his impressive entrepreneurial spirit by elaborating the principles of interchangeable components and automated production. Results were not long in coming and Zenith already established itself firmly on the international markets in the 19th century. By offering the most reliable and accurate watches ever made, the Manufacture soon earned worldwide recognition of its virtuosity and sealed its destiny as bound up with chronometric (precision-timing) performance. Early marketing moves in an industry that was swiftly becoming an artGeorges Favre-Jacot was an outstanding visionary who also charted other paths, including working closely with a star architect of the era: Alphonse Laverrière. Their cooperation was closely linked to the international “Werkbund” movement that aimed to infuse industrial products with an aesthetic and even artistic dimension. 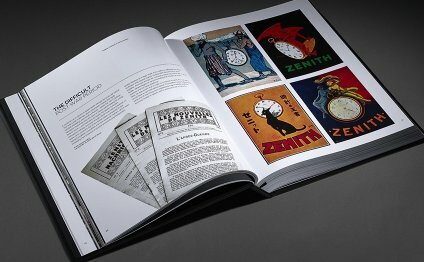 In portraying its Manufacture, its products and its stores as a unique work of art, Zenith paved the way for a new era that would only fully unfold decades later in the watch industry: that of branding. The watchmaker and the architect nurtured a shared vision based on the belief that all visual aspects of a company and its production must be in complete harmony with the product itself. The two men soon established themselves as the spearheads of this reform of the visual arts in French-speaking Switzerland. Under the impetus of Alphonse Laverrière, Zenith developed, conceived and produced all decorative elements of its shops, thereby inventing what has now became known as the flagship store concept. While hundreds of projects for clocks, table clocks and wristwatches were emerging, layouts for presenting the collections were developed, packaging paper was designed, along with presentation boxes and display stands representing the watch industry’s first point-of-sales advertising. The Manufacture in Le Locle was definitively named Zenith 1911, coinciding with completion of the construction work that lent the site its unique character exemplifying industrial architecture and now a listed UNESCO world heritage site along with the towns of Le Locle and La Chaux-de-Fonds.